from the community when the matter was referred to them by one of the parties involved in the dispute for amicable settlement. The two parties are currently living in harmony. Similarly, a conflict between two rivals that had been raging for years at Peki Adzokoe has also been resolved through the same means. The two women now live in harmony and interestingly go to the farm together. The two cases are among 60 that have been settled through ADR within six months in 15 communities in the Volta Region. The communities are Hlefi, Anfoeta Chebi and Tsito Awudome in the Ho West District; Avee Tokor, Gbogame, Hodzo Aviefe, Hodzoga in the Ho Municipality; Peki Adzokoe in the South Dayi District; Logba Adzakoe, Ve Koloenu, Tafi Abuife, Tafi Mador and Tafi Atome in the Afadjato South District, Anfoega Agata and Agatanyigbe in the North Dayi District, and Kpando Agudzi and Kpando Dafor in the Kpando Municipality. 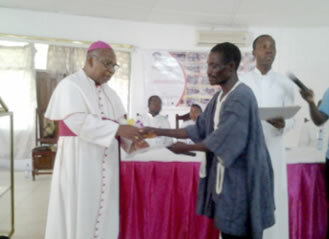 The processes of resolution were undertaken by the Ho Catholic Diocesan Development Office under a programme dubbed, ‘Enhancing Human Resource for Growth and Development at Community Level: Access to Justice through Alternative Dispute Resolution’. 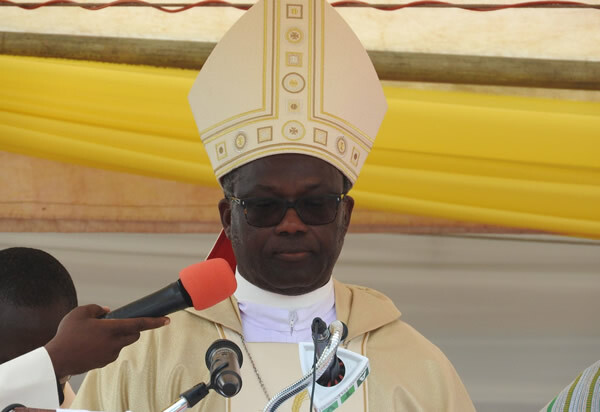 It was spearheaded by the Bishop of the Ho Diocese, Most Reverend Francis Anani Lodonu, and was funded by the Ho Diocese of the Catholic Church and Star-Ghana in partnership with USAID, EU, UKAID and DANIDA. The ADR programme was aimed at bringing justice closer to the less privileged in conflict-prone areas. About 260 people, made up of traditional rulers, religious leaders, community-based organisations, assembly members, unit committee members and people of notable standing in the communities were selected and trained as mediators and arbitrators to settle disputes in their various communities. Before the introduction of the ADR concept to the communities, cases were settled using traditional, religious or the court system, but these processes often triggered further animosity after cases were settled because the procedures of adjudication produced a victor and a victim. Many people could also not seek for justice because the processes were expensive. Following the successes achieved so far with ADR in solving cases such as land litigation, marital problems, family disputes, child custody, disagreement among siblings over properties, land boundary disputes and defamation, people who hitherto did not trust the process to deliver justice have now embraced the concept, which is fast gaining popularity in the communities. ADR is a means of settling disputes amicably without going through the formal judicial system. It deals with non-criminal cases and the process of settlement is by meditation, arbitration and negotiation. The process is backed by law and terms of settlements are enforceable by a court of competent jurisdiction. In settling disputes, therefore, one of the preferred choices across the world has been the use of the ADR process. Though ADR has been in use in the country for some time now, not many people have knowledge of what it stands for. A baseline survey carried out by the Ho Catholic Diocese in 2010 showed that although the St Francis Peace and ADR centre existed in the Catholic secretariat in Ho, it was not accessed by the people; the reasons being that majority of the people, about 90.5 per cent, had never heard of ADR and also the two centres that held sittings were a long distance away from many of the communities. The study further revealed that only 9.5 per cent reportedly knew what ADR was. It said 1.1 per cent of the people used the services of the formal courts, 3.3 per cent engaged the services of ADR while 95.6 per cent enlisted the traditional arbitration system. In an interview with the Daily Graphic, some people who had benefitted from the ADR process said they were satisfied and trusted the process. A trader from Hlefi, Ms Rose Kplem, who was involved in an ADR process, said she would always opt for ADR as against going to the court, because with the ADR process she was able to express herself well. According to her, besides being a waste of time and money, the court process was also cumbersome and did not promote peaceful co-existence. Ms Kplem shared her experience as a witness in a land case at a district court, where she felt intimidated by the number of people in court when she stood in the witness box to testify. “I had to speak through my lawyer to the judge and because of the fear I had, I was unable to answer questions well,” she added, and argued that if one was to win a case in court, it would depend on how good one’s lawyer was even if the one had a good case. For her, ADR was cheaper, less stressful and promoted reconciliation and unity. The ADR programme coordinator, Sister Margaret Mavis Ankamah, said what made ADR popular was its win-win situation (backed by law) and also because litigants had the option of selecting the people to handle their cases. She acknowledged, however, that in spite of the success of the programme, there were challenges that needed to be addressed to make the system more effective. “The greatest challenge to the ADR process is with documentation of cases settled and terms of settlement because of the difficulty in constructing the statement of settlement,” she said. She said in some instances, the ADR process was not successful because some parties involved in litigation were not satisfied with the way their cases were handled, describing the mediators as inexperienced. According to her, more centres must be established in all the districts to popularise ADR in the region. “This would help to decongest our courts,” she said.